Josh Kidder of Archbold drives the ball upfield Tuesday versus Liberty Center in a Division III boys soccer district semifinal. The Bluestreaks opened up a 7-0 lead and cruised to an 11-3 win. 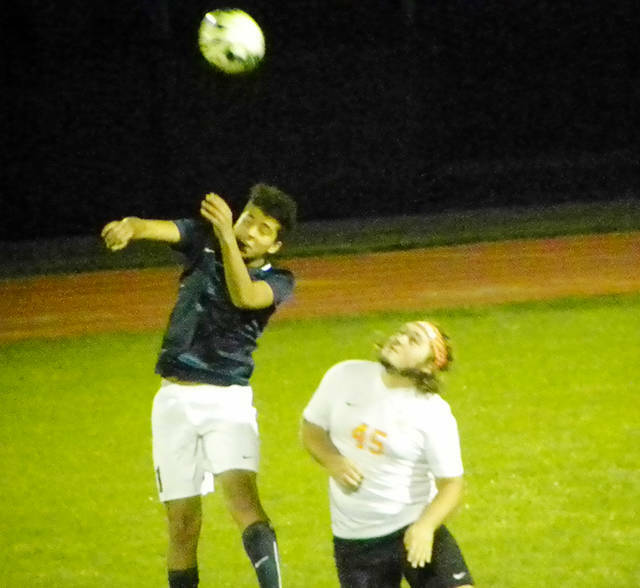 Josiah Magallanes of Archbold with a header during Tuesday’s match. ROSSFORD – Archbold scored off first touch and did not stop. 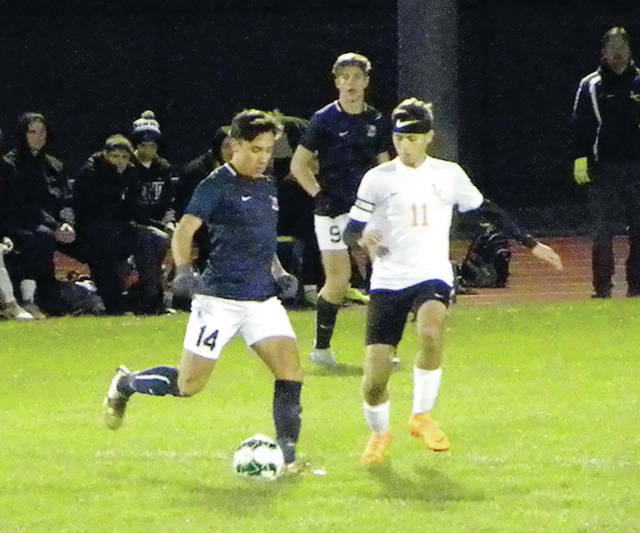 Tallying the first of 11 goals just 10 seconds into the game, the Bluestreaks reached the Division III boys soccer district final yet again with an 11-3 win over Liberty Center Tuesday at the Glenwood Athletic Complex in Rossford. Trey Theobald took off and beat the Liberty Center defense to start the game. When he received the ball, he hit Josh Kidder with a touch pass and a goal 10 seconds into the game. Kidder added a second goal and Elijah Zimmerman tacked on a goal for a 3-0 lead with 37:09 left to play in the first half. The Streaks were not close to being finished. Still inside the first 10 minutes of the half, Andrew Hogrefe added a goal when the Liberty Center keeper came out to play the ball. Hogrefe poked the ball past the prone keeper for the fourth Archbold goal of the game. Kidder followed by heading in a corner kick for a 5-0 lead with 30:32 left in the half. Waiting three minutes to strike again, Clay Gerig struck from the left side, followed by a goal from Zimmerman to up the score to 7-0 with 26 minutes left in the half. The Tigers did strike back to let Archbold know they were in the game. Zach Miller had a nice move by the net to score, followed by a long range goal from Jacob Hoffman, to cut the score to 7-2 with 22:11 left in the half. Those goals, however, would be matched by the Streaks. Zimmerman finished his hat trick – plus one – with a pair of goals in the final 10 minutes of the half to make the score 9-2 at the break. Gerig scored his second goal of the game when he cut in from the corner and took a shot on net. Theobald finished the Archbold scoring by touching in a header with 15:35 to play. The Tigers tallied the final goal of the night when Miller scored his second of the night inside the final 10 minutes. Archbold will now meet either Ottawa Hills or Ottawa-Glandorf in the district final. The district final Saturday has a 3:30 p.m. start.